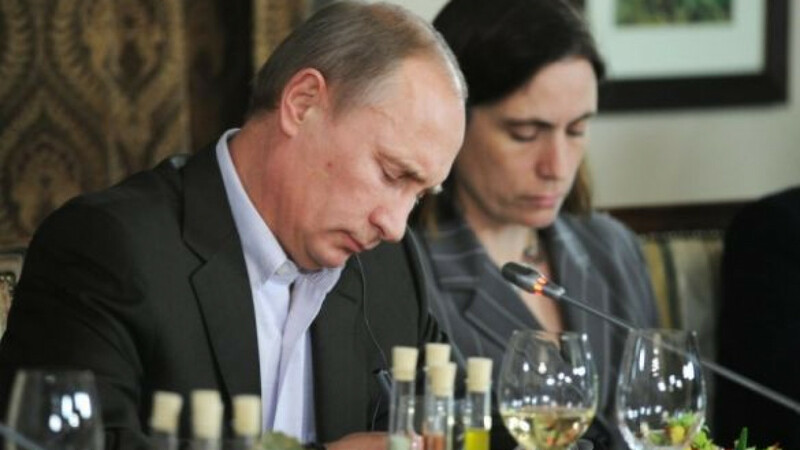 President Vladimir Putin deep in thought at last year's Valdai Club event. NOVO-OGARYOVO — President Vladimir Putin acknowledged Thursday that he had to make a difficult choice when he approved the purchase of TNK-BP by state behemoth Rosneft, as the decision contradicts the government's policy to reduce its presence in the economy. But he made it clear that the government had to intervene after numerous requests from BP to help resolve a long-lasting dispute between the shareholders of the Russian-British joint venture. "Both the government and I had mixed feelings when the idea of this project appeared," Putin said at a meeting with the members of the international Valdai Discussion Club, referring to the intention by BP to sell its stake in the joint venture. A move by a state-controlled company to increase its market presence "at the cost of its foreign partner" raised doubts, Putin said, adding that at the time there were concerns that Rosneft might subsequently take over the second part of TNK-BP, owned by the AAR consortium. "This, in general, is not in line with our trend to reduce the growth of the state sector," he said. Rosneft announced earlier this week that it would acquire 100 percent in TNK-BP from BP and AAR in two separate deals totaling $61 billion. When TNK-BP was founded in 2003, the Russian authorities weren't opposed to BP's holding a controlling stake, Putin said, adding that he warned that the 50-50 joint venture wouldn't function properly. He recalled that the shareholders had promised at the time to settle possible issues peacefully, but they ended up being involved in continuous struggles that eventually turned into "hand-to-hand" fighting. BP clashed with its co-shareholder in TNK-BP, a consortium represented by Soviet-born tycoons Viktor Vekselberg, Mikhail Fridman, German Khan and Len Blavatnik. Although the government tried to stay out of the corporate battle, which prompted Robert Dudley to quit as head of TNK-BP and leave the country in 2008, it had been repeatedly approached by BP seeking help in resolving the dispute, Putin said. "We couldn't say no to them, because otherwise it would look like we were forcing them to be under TNK, with which they had continuous conflict," he said, adding that the presence of a BP representative on Rosneft's board of directors would ensure greater transparency of the Russian company's operations. Putin also said the sale to Rosneft of the rest of the joint venture had been initiated by the AAR consortium. The problem of reducing Russia's dependency on natural resources was dwelled on during Putin's meeting with members of the Valdai Club, which was founded in 2004 to facilitate dialogue between Russia and foreign experts. Raising a glass of white wine, Putin welcomed 50 members of the club, including Russian and foreign economists and political analysts, to his Novo-Ogaryovo residence, saying he was glad that the international business community is interested in the country. Politics dominated the agenda at last year's Valdai Club meeting, as participants were interested primarily in Putin's outlook on new models of the country's governance as he was preparing to run for his third Kremlin term. This year, experts focused primarily on economic issues, including the diversification of Russia's economy, external risks from heavily indebted Europe and measures to improve the country's investment climate. The Novo-Ogaryovo meeting was the final part of a four-day forum in which about 100 members of the club participated, having gathered in St. Petersburg on Sunday to discuss possible scenarios for Russia's development over the next two decades. Among the issues discussed by the club this week were the creation of a favorable business climate, development of competition in Russia, stimulation of domestic investment and the fight against corruption. Members prepared a report containing recommendations for the government on how to proceed with reforming the country based on the pace of Russia's current economic growth and the prospects for its economic development. The club members suggested four possible scenarios for the country's economic development, which are based on two groups of factors, said Piotr Dutkiewicz, director of the Center for Governance and Public Policy at Carleton University in Canada. The external factors include dependency on energy resources and the volatility of global financial markets, while domestic ones were related to the efficiency of the country's institutions, he said at the meeting. Russia's future depends primarily on a focus on domestic factors like "improving the quality of governance on all levels from you and local authorities," Dutkiewicz said, addressing the president, who promptly reacted. "Everything is OK with me," Putin said. Dutkiewicz also said the government should enhance dialogue with the liberal segment of society as well as small and medium businesses. The participants touched on issues of Russia's integration into Europe and the development of alternative industries to oil and gas production. One answer the experts hoped to get from the country's leader was how he plans to proceed with implementing the reforms outlined in his pre-election articles published in leading Russian newspapers. The issues highlighted in Putin's articles are important and deeply thought out, but they were followed by "a period of silence," Dutkiewicz said in an interview before the meeting. "The overarching question that everyone would like to ask is 'where to go?'" he said.